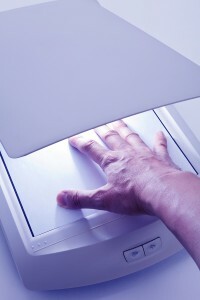 How Does a Paper Scanner Work? 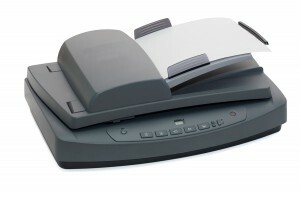 There are a few different types of scanners to choose from when you are thinking of purchasing one. How the scanner works will depend on how what kind of scanner you purchase. A scanner that provides a flat, glass surface to hold pages of paper, books, and other objects for scanning. The scan head is moved under the glass across the page. Sheet feeders are usually optionally available that allow ,multiple sheets to be fed automatically. a scanner that is moved by hand over the material being captured. Handheld scanners are small and less expensive than their desktop counter tops but partially rely on the user’s dexterity to move the unit across the paper. Trays are available that keep the scanner moving in a straight line. A type of scanner used to capture the highest resolution from an image. Photographs and transparencies are taped, clamped or fitted into a clear cylinder (drum) that is spun at speeds exceeding 1,000 RPM during the scanning operation. A light source that focuses on one pixel is beamed onto the drum and moves down the drum a line at a time. This scanner that allows only paper to be scanned rather than books or other thick objects. It moves the paper across a stationary scan head. Here are the steps the occur in a flat bed scanner. The process may differentiate slightly from these steps if you use one of the varying scanners listed above, however, this gives a good idea of how the documents are scanned onto the computer. The document is places on the glass plate of a scanner and the cover is closed. The inside of the cover in most scanners is flat white or black. The cover provides a uniform background that the scanner software can use as a reference point for determining the size of the document being scanned. A lamp is used to illuminate the document. Do you need Scanning Services? Record Nations can help! If you have documents that you would like scanned but aren’t ready to invest in a scanner just yet, we can help. Record Nations has a network of scanning experts who use the most reliable, state-of-the-art techniques to scan your data and get your business working paperless as quick as possible.